Greetings out there in the Super Indian Universe! It’s that time again — the annual San Diego Comic Con. Now mostly known for the big Hollywood panels to promote movies and television projects…they do still feature comic books. We’ll be there to represent “Super Indian” and the Indigenous Narratives Collective. Work is continuing on Issue #5 — “The Curse of Blud Kwan’Tum.” Many of you have been reading and enjoying the story and the “Twilight” spoof. Believe us — we have been enjoying the writing and art coming out of Rezium Studios. We’ve all got big smiles on our faces here! 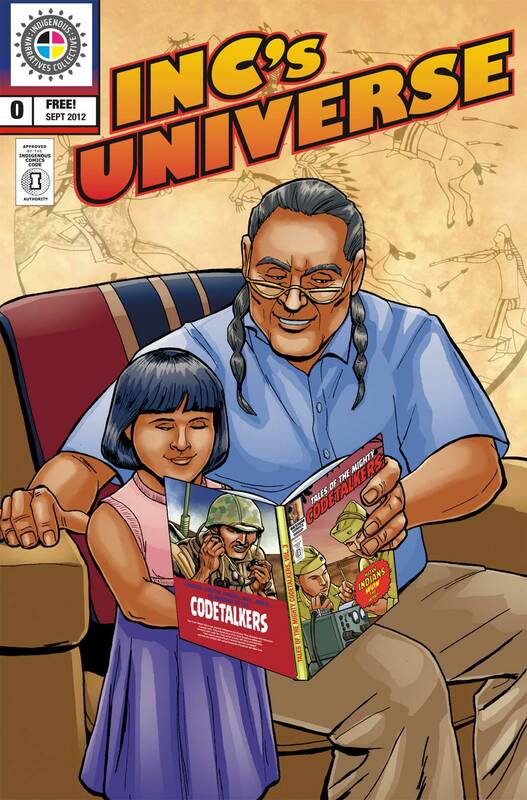 At the Denver Comic Con, the Indigenous Narratives Collective’s Executive Director Lee Francis IV made a blow-up of the the cover of “Tales of the Mighty Code Talkers” that’s featured on the cover of “INC’s Universe #0.” We had so many people stop and ask when the book would be out that it was decided the stories should go into production. The project is still coming together, but Arigon Starr has already started work on her portion of the story featuring the Choctaw Code Talkers. Here’s the original cover of “INC’s Universe #0.” Note the very small graphic of the comic book that the Grandpa is reading to his grand-daughter. Here’s the artwork in a more viewer friendly size. 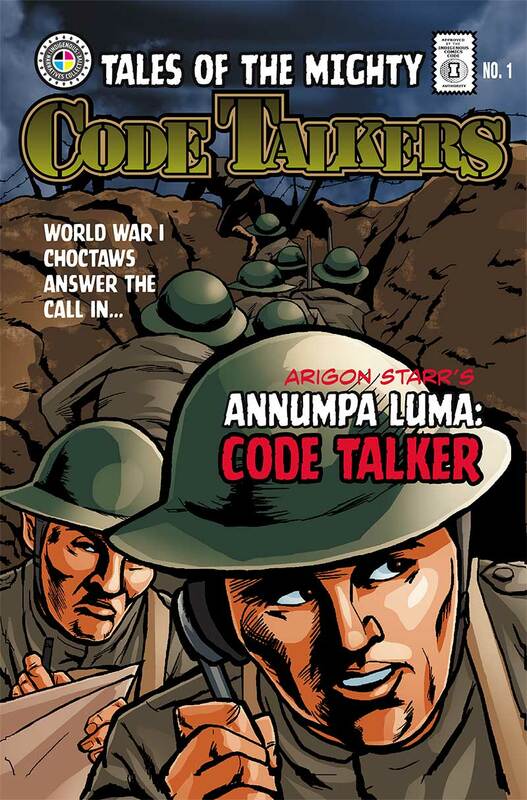 Arigon’s Code Talkers story will be a 12-page narrative that will become a part of a bigger volume with stories of the efforts of many different Native tribes’ involvement with the program. “I know it wasn’t just Choctaw men who were in the program. Creeks, Meskwakis, Comanches, Cherokees…their stories have remained untold in comic form,” said Arigon. Here’s a sneak preview of the artwork Arigon is working on for her Choctaw Code Talker story. More updates from the San Diego Comic Con very, very soon! Previous Denver Comic Con A-Go Go! Hey, thanks so much for checking on our progress regarding “Tales of the Mighty Code Talkers.” The graphic novel project is a group effort from members of the Indigenous Narratives Collective. Everyone is hoping the book will be out in 2014. Arigon Starr is working on her contribution, which is the artwork we shared here on the “Super Indian” website. As you can imagine, she’s having a time juggling her busy performing/writing career in addition to creating the next two issues of “Super Indian,” plus the planned compilation, “Super Indian Volume Two.” We’ll keep everyone posted on the progress. Thanks again for asking — we are all super glad you want to check it out. We hope folks will want to purchase a copy for their own and maybe a few copies for the local library or school as well. 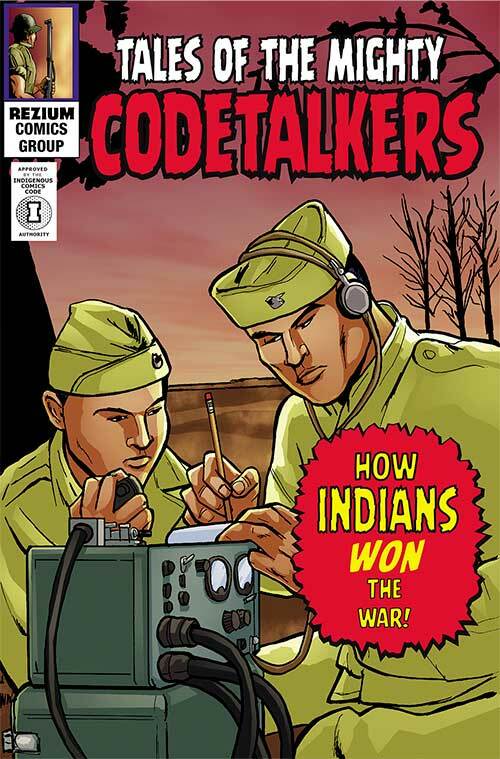 We can’t wait for “Tales of the Mighty Code Talkers,” too!